Watching young children pulling their chariots on the street on rath yatra makes my mind wheeze through the rath yatra day memories of my childhood. That excitement of decorating the vehicle with flowers, diyas, coloured papers, etc. throughout the day, that journey traversing the locality along with many other similar rath pullers with a blissful smile on the lips, that offering and a gentle pull of the chariot by a complete stranger whom I offered some of the Prasadam. Then there was the other excitement that came from the later part of the day. The fair. It held immense value of pleasure for every child of that time. Those wet fields, earthen utensils, colorful birds in cages and last but not the least the immense quantity of sweetmeats were a delight to all the senses. This classic traditional malpua recipe comes from my dida [grandmother]. It is a very popular sweet dish. The khoa kheer adds a sweet texture and palm molasses adds flavor to the Indian pancake on the celebration day. The last stock of yearly stored Bengal date palm molasses is used up finally in the preparation for the celebration, and the eager wait for the next stock is renewed. Bengal date molasses syrup or 1 cup water and ½ cup sugar for making syrup. Take sugar for syrup in a pan and turn on the heat. Add water to make syrup , let it boil to make one thread of syrup, consistency is important because if it is too thin the malpuas tend to fall apart. [To make one-thread consistency sugar syrup you need to check after boiling sugar in the water. Test the syrup by taking a pinch of the syrup between the thumb and the index finger and close and pull apart the fingers to see if it is making a thin thread or not.] Add 1 teaspoon fresh lime juice and one pinch salt to balance the sweet taste and turn off the heat, keep warm. Mix yogurt, all-purpose flour, wheat flour, semolina, khoa kheer [optional], fennel seeds, sugar, salt and add milk to form a smooth semi thick batter. The batter should have a pouring consistency. Keep aside for half to one hour in a warm place. It will be slightly risen up by then. Heat oil or ghee [you can add one or two teaspoon ghee to the oil to add flavor] in a pan for deep frying the mulpuas. First heat the oil on high flame, then keep the fire to simmer, otherwise it will burn the malpuas from the outside and not be cooked properly inside. Add one teaspoon hot ghee or oil in the batter, beat until smooth. It will help to soak less oil in the frying process. [you can add water soaked raisine here, optionally]. Scoop out one laddle of the batter dropping them in the oil and fry one malpua at a time. The batter will be spread up like a round pancake and will be perforated and puffed up slightly, fry carefully until both sides are golden brown let the edges curl up slightly and crisp. Keep constant watch while frying. Remove fried malpuas from oil on a kitchen tissue paper, then dip the them in the warm syrup, keep soaking for half an hour. Drain excess syrup and serve hot. * Bengal date palm molasses have very distinctive flavor and taste, so we always avoid any extra spice or flavored oil to fry mulpuas. * For sugar syrup based mulpoas add one tiny pinch of camphor, which will give an extra flavor as well lemon juice and salt to balance the sweetness. * Rose petal can be added during garnishing. It can be served hot or cold. Serve with hot crispy fried papad to celebrate the festival. You might also be interested in our Dol yatra festival and recipe. The meal or bhog (mahaprasad) offered to lord jagannath holds intrinsic ethical value even in our modern lives. The principles behind it such as the timings of offering, the preparation and the process of serving if followed and maintained today can ensure the wellbeing of every individual. For example, the timings of offering the bhog devised by our ancestors was decided keeping in mind the routine need of energy by the body and can be observed even in modern diet charts. The preparation involves boiling in particular and prohibits the use of oil and other spices therefore ideally nutritious in content. The serving holds social integrity as there is no place for social divisions of castes, creed etc. Thus the ritualistic practices let alone the religious side of it throws light on a path that is universal for all past, present and upcoming generations to follow. Mahaprasad is the main offering of rice in Jagannath Temple. In most temples of India, devotees may take "Prasad", holy food that has been offered to the deities, but only in Jagannath Puri this blessed food is called "Mahaprasad''. "MAHA" has two meanings here. First, it means great. Lord Jagannath is described as Maha Bahu and Maha Prabhu, so this word Mahaprasad itself gives us the impression of something great. The second meaning of Mahaprasad is MA-PRASAD" and also called "Nirmalya. If someone is sick, Mahaprasad is healing. If one takes Mahaprasad daily, people say, he will never suffer from disease in his life", that which makes one completely pure like a lotus. Only Mahaprasad can be eaten by all together, whatever the religion or race, even on the same banana leaf. Another name of Mahaprasad is "Kaibalya", which gives Moksha, salvation or liberation. It is said if one takes this food of Lord Jagannath, he will have not only physical well-being, but spiritual enlightenment as well. To seal any promise or vow, two friends hold a pot of Mahaprasad together and eat together from this same pot. This pot is called Abadha, meaning that which cannot be taken away or put into another pot. Friends then say to each other, "You are my Mahaprasad , You are my ABADHA." When they see each other in the future, they address each other as "Abadha" only. The tradition of sharing Mahaprasad found in Jagannath temple is based has been greatly influenced by the Savari tantra as He is the deity of the Savara tribals. Jagannath's Mahaprasad is called "Abadha." In the tribal Saura language spoken by the Sabaras, Abadha means the act of boiling some thing in water. Mahaprasad is called so as the rice used in it is boiled in water - [Ab-ada = boiling in water]. Mahaprasad comprises two main varieties viz Anna Mahaprasad [lunch/dinner variety], and Shukhila Mahaprasad [Snacks variety], Anna Mahaprasad consists of Anna [rice], Dali [Lentils & pulses], Dalma [vegetable and pulses], Shag [Spinach], Khata [Pickle], Kanika [Fried rice], Ghia Anna [ghee-mixed rice] etc. Only indigenous vegetable are used in the temple kitchen. Potato, Tomato etc. are not used due to foreign origin. Token Anna Mahaprasad taken in two fingers is called Kaibalya. Dried Anna Mahaprasad is called Nirmalya and it is customary to take a grain of Nirmalya to complete Puja process in the morning by the ladies. Very small packs of grated coconut mixed with jaggery in a piece of dry leaf is called Sukhili and is available at nominal cost. Pilgrims distribute Sukhili in villages after return from Puri. Sukhili also accompanies betel leaf and nut as a part of invitation in marriage ceremony and thread ceremony. Specified Bhog items are supplied by specified Maths on specified days. The kitchen fire is called Vaishnava Agni, because it is the fire in the kitchen of Lord Jagannath. Charcoals are kept burning day and night by one worshipper, called Akhanda Mekapa. Clay pots are placed in a special earthen oven, five in number, one on top of another. Yet the one on top is cooked first, not last. Another strange phenomena is that many times pots are broken on the way to the temple or the food is spoiled in preparation and must be discarded. It is said that the cook was impure in some way. In the temple, masala and spices such as cardamom and cloves are added only after offering, after that Mahaprasad is brought to Ananda Bazaar. Sri Jagannath is the Lord of the Universe. His kitchen is considered as the largest and the biggest kitchen in the world. It is situated southeast direction of the outer compound of Srimandir. The length of the kitchen is 150 feet, breadth is 100 feet and height is about 20 feet. It consists of 32 rooms with 250 earthen ovens within these. Around 600 cooks [Suaras] and 400 assistants serve here everyday for preparing Lord's food. "Multifarious dishes of six-fold tasters, fifty-six bhogas are offered day and night". In the kitchen of Srimandir four types of rice are prepared. These are Salianna, Khiraanna, Dadhianna and Sitalaanna. Sunakhila rice cooks along with ghee and Phalatabha Kharada Lavana to get Salianna. For getting Khiraanna alongwith Basumati rice; cow milk, ghee and Kharada Lavana are mixed and cooked. Similarly plain rice mixed with curd; Dadhianna is prepared and rice mixed with Tabharasa and Kharada Lavana; Sitalaanna is prepared. Bhandar, which runs by Suara Nijoga Cooperative Society. The earthen pots used for cooking foods are provided by Kumbhakara Nijoga Society. The potters of Kumbharapara and nearby areas supply these pots the temple kitchen. The required timber for the kitchen was previously supplied from different forests of the State. But after nationalisation of forests, the State Forest Corporation is providing timbers for cooking purpose. Daily 5,000 persons may be fed, but on big festival days, one to ten million may be accommodated. The temple kitchen of Lord Jagannath is therefore considered to be the biggest hotel in the world, serving all without reservation or previous notice. Gopal Ballav Bhoga Puja 9 AM This may be termed as the morning breakfast of the deities, which consists of khai (sweet popcorn), kora (coconut sweets), khua laddu, ripe banana, curd and chipped cocoanuts. The offerings are made at Anasara pindi / allabha pindi. The items offered are Paga Khai; coconut-sugar-plum; sweet bananas; Khuarnanda curd: butter and small coconut pieces etc. Madhyahna Dhoop 1 PM Mainly the items offered are—arisha; pitha puli; tipuri; mathpuli: kakara; chadheilada; tata manohar; khairachula: marichaladu; pheni; takua; gaja; biribadi; anna; mugadali; pitianna; oria; marichapani; khiri; subashpakhal; sakara and pana etc. 7 PM The items of this Dhupa are mostly Pakhala [watered rice], pitha [cake]. It includes varieties of puddings; confections and delicacies called Kanla puli, Takua, Mathapuli, Bhogapitha, Gotali, Kakara, Amalu, Jhadeineda, Kadamba and Subasa Pakhala. 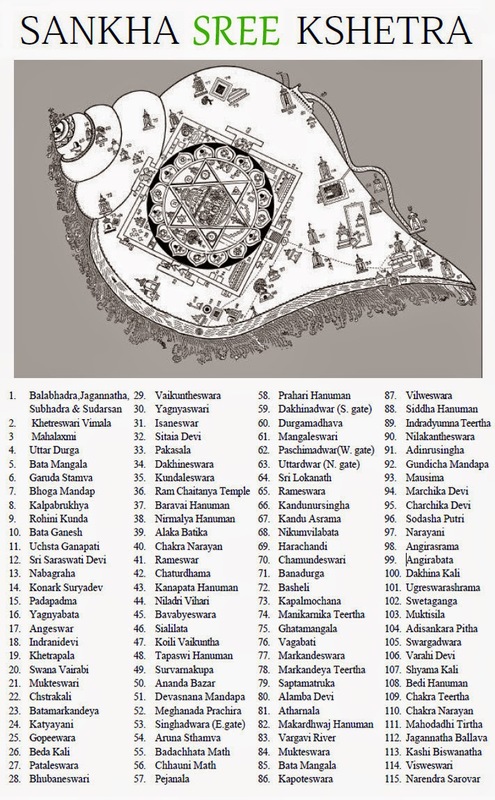 The items offered to the deities are kaanla puli, takua, mathpuli, bhog pitha, gotali, bada kakara, sana kakara, luna khuruma, amalu, suar pitha, rosh paika hiribuha, jhadeinada, subash pakhal, sana and bada kadamba etc. Badasimhar Dhoop 11.15 PM The items offered are — Pure ghee in a silver container; Kadali Bada; Khiri; Sakara; Pitha and Kanji. 9. Thali Khechedi- lentil rice with sugar and ghee. 20. Luni Khuruma- made of wheat, ghee and salt. 33, Rosapaik-cake made of wheat and ghee. 42. Sarapulli- This is the most famous and most difficult milk dish to prepare. It is made of pure milk, boiled slowly for hours, and spread into a large pizza - shaped pan in thin sheets. Only very few cooks of the temple today know the art of making this MAHAPRASAD. 47, Dalama - this is one of the most typical dishes in an Orissan home. It is a combination of dal and vegetables, usually eggplant, bean, sweet potato, and tomatoes, although tomatoes are not used in temple preparations. Coconut and a dried root vegetable known as Bodhi which looks like a mushroom and is high in protein are added. 53. Khata - a sour side dish made of cooked mango, or apple, mango, and grape mixed and cooked together. The word bhoga in Oriya and Sanskrit means enjoyment. This word is commonly used in Orissa in the context of food offerings made to the deities in the Temple. Every day and through out the year, fifty-six varieties of dishes [Chhappan bhogas] are prepared and offered to the deities. Apart from this, several other varieties of dishes are also prepared and offered on the occasion of different festivals. Rosha Homa : The method of preparation is very hygienic and the traditional processes of food preparation for many people in a very short time take many by utter surprise. Bhogas are of two kinds : - [i] Those that are cooked and prepared inside the temple kitchens are called "sankhudi". They are prepared out of rice, black gram and other vegetables [ii] Those that are prepared outside the kitchen but inside the temple specified for the purpose are called Nisankhudi Bhogas. The bhogas are offered to the deities prepared by the Suaras very deliciously in season times accordingly. 1. During Baisakh and Jyestha, in April, May and June the deities are offered the following bhogas like - Dahi Pakhala [watered rice with curd], Saga, Chhena Mandua, Biri pitha [cakes prepared out of black gram]. 2. On pana or Visuba Sankranti day the Gheuties made of flour, curd, cheese and molasses] is offered in the morning and delicious drink in the evening. 3. During the month of Asadha [during Car Festival, June-July] the deities are offered a special drink called Adharapana [Adhara means lips] as the drink sweetness the divine lips. 5. During the month of Bhadraba, [Janmastami, August to September] the deities are offered the same food as mentioned above. 6. During the month of Kartika [October-November] The deities are offered Lunilia [salty parched paddy] early in the morning which is called Bala Bhoga. 7. During the month of Pausa [December] the deities are offered Pahili Bhoga, i.e. the First Food offered rather early in the morning. It is a delicious Khechedi preparation. The episode runs that as Mahalaxmi, the divine consort moves to her father's house, Yosoda, the mother of Lord herself prepare this delicious Khechedi to the utmost satisfaction of her son. 8. On Baula Amavasya day the Gaintha cake, new mango blossoms, powdered rice fried with ghee and Nadi mixed with ghee are offered. 9. During Makara Sankranti day, on 13th or 14th January the deities are offered Makara Chaula [i.e. fresh uncooked rice well moistered and mixed with milk, jinger, black peeper, candy, coconut, cheese camphor, raisin, ripe banana etc. 10. During Dolayatra, in the month of February-March the deities are offered Chhenagaja, Khanda Vari, Canaladi [Ambakasi] Dahana chori, Arisa and Kakara. 11. Dhupas [Divine Meals] Morning - For morning refreshment, the deities are offered the following platters, Gopal Vallabha, Fried Paddy, Sugar coated Coconut, butter, Khuamanda, Papudi, fruits like Banana, Guava and Coconut chips etc. 12. For morning meals which is called Raja Dhupa, the deities are offered as following as Kakatua Jhilli, Kanti, Enduri, Jinger tonic, fried green leaves, fried rice, dal and curries. 13. Forenoon - The deities are offered Bhoga Mandap Dhupa. It includes Rice, Vegetable curries and cakes. 14. Midday-afternoon - They are offered Oriya cooked Ghee Arna [made of rice, salt, ghee and orange juice], Dal, curries [Besara Mahura] cakes, sweet Kakara, Arisa, Maricha Ladu, Pomegranates, Bada, a drink prepared out of black peeper, banana etc. 15. Evening - The Sandhya Dhupa consists of cooked rice, and watered rice, Mathapuli, Kantipuli, Jenamani, Parijataka, Mandua, Rasavali, Suaridal and other curries etc. 16. Evening - The platters are called Badasinhara Dhupa or Sayana Dhupa. It consists of sweet watered rice, Bananabada, plaintain fry, Bhoga Kshiri [a liquid made of rice, milk, sugar and spices] Chadhei neda green coconut and bettle [sandal paste instead of lime and without tabacco]. Here are recipes for some of the most common Jagannath "PRASADAS.". Make and offer to your Lord, close or far relatives, friends and foe, share with neighbor and stranger, spread the humanity. The private physician of the royal family prepares a special nutritious sweet and medicine bhog for Lord Jagannath dev due to his fever and illness after Snan-purnima so he spends fortnight in nirodhan griha. The devotees can get the medicine prasadam as well. A sherbet of cream and sugar candy and a glass of green coconut water mixed with a dash of camphor is also offered along with it. Sago or tapioca in milk with bay leaves and cardamom. A judiciously grind neem leaves, haritaki, nutmeg [ jaiphal ], kalmegh [ a very bitter leaf ], ginger, honey, cinnamon, black pepper, siddhi leaves and camphor. They then dissolve it in pure cow milk and Ganga water. The lord takes this along with green coconut water. Soak some roses, mallika, bel and jesmine flower in water for two hours. Sieve this water through a clean cloth and keep aside. Boil rice, drain the starch. Wash cooked rice in cold water. Mix the flower infused water with the rice. Add salt to taste. Offer Lord Jagannath with a soup of raw plantain, brinjal, pointed gourd, ghee, and the simple spices. It is a slightly bitter bhog. Cube plantain flower, plaintain stem, eggplant, potato, sweet potato, sweet gourd. Add shredded coconut to the vegetables. Roast fenugreek, cumin, black pepper and coriander seeds and powder them. Boil all the ingredients together. Add a seasoning of cumin in ghee. 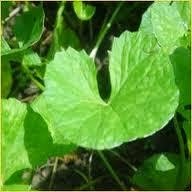 Take the bark of Garud-goinda tree [you will get this only in Puri] Dry it in the sun. Powder and sieve it. Then mix it with water and powder rice. Make a batter as thick as cake batter. Heat ghee in a pan. Pour one spoon of batter at a time and fry it. Then dip in thick sugar syrup. Lord Jagannath’s bhog is never complete without leafy vegetable. The Oriya people call it neutiya. Boil the leaves with salt and ghee, then heat ghee in a pan. Add cumin and Asafetida to it. Put the boiled leafy vegetable in it and mix nicely. Rice mixed with lentils 2 cups Arua or Basmati Rice 4 cups water 1/2 teaspoon salt. 1/2 cup Channa Dal Boil all the above until the water is absorbed, about 20 minutes. Add ghee, hingu after. In the temple kitchens cashews are not used, as they were considered Ravana's food in Sri Lanka, but they may be added in the home. Rice mixed with ghee and sugar. This rice preparations is cooked in the same way as the first but adding 1/2 cup sugar to 2 cups rice. Cloves may be added after removing the rice from the fire. A dal and vegetable dish common in Oriya homes. 1 cup Harada Dal [a type of lentil] 4 cups water 1/2 teaspoon salt 1/2 teaspoon turmeric. When the lentils are boiling ahout 10 minutes and slightly soft, add chopped vegetables such as potato, tomato, [in the home only], bean, eggplant, sweet, potato, one tablespoon of ghee can be added at this time and half of a grated coconut on top. When the vegetables are soft, spices are added. In a separate frying pan, 1 tablespoon putano, or curry spices, 1 teaspoon cumin, and 1 or 2 dried red chilis are fried in ghee. The Dalama is then mixed with the spices over low heat until the soup becomes thick. A sweet milk preparation There are many types of Khiri in Purl, but rice khiri, suji khiri, and chuda khiri are most common. If rice is used, it is boiled till it is very soft and mushy, then milk is added. Suji is cracked wheat; it must be browned first until a sweet smell comes and then cooked in milk. If Chuda Khiri is being prepared, this flat dry rice must be ground to a fine powder and then added to the boiling milk. Half a cup of raisins, and at home half a cup of cashews may be added at last. Also cardamon powder may be used on top. A sweet pastry made of fine corn flour, much like the Greek Baklava. As Khaja is a dry sweet, it can last one month and is the most usual Mahaprasad taken on long journeys to distant places. First the fine com flour is kneaded and rolled like chappatis on a chappati board. It is made into fine layers, like Baklava's Mo dough. This is done by first cutting the Khaja pieces into flat strips. With the three middle fingers, the cook dips his hand into a bowl of 1/4 cup ghee and 1/4 cup water. He runs his fingers in straight lines across the rolled dough. Then the Khaja is rolIed like a chappati or tortilla and cut into 1 "sections. These are rolled out. flat, in pieces 4 by 6". In hot ghee they are fried until golden brown. Hot sugar water is boiled until it becomes a thick syrup [1 glass sugar, 3 glasses water]. The fried Khaja are lightly dipped in this syrup and set aside. Khaja soaked in leftover sugar milk for one or two minutes, then the milk is drained off. This is an addition to Bhog. 1 cup sooji 1 cup ghee 1 cup sugar Sooji is fried in ghee until the color is golden brown and a sweet smell comes. Sugar water is boiled and the sooji is very slowly added. When it is thickened, 15 minutes or more, raisins and cashews are mixed. Special varieties of cake prepared out of recipes like rice-powder, molasses, coconut, camphor, ghee etc goes in the name of Podapitha [burnt-cake ]. The size of the cake varies according to the number of family members. Cakes are also exchanged among relatives and friends. Young girls do not take rice during Raja Sankranti festival and sustain only with different types of cake, fried rice [muri] and vegetable curry. A sweet curd drink For the 15 days between SNANA PURNIMA and RATH YATRA, the deities are said to be sick. They take no food, but only this cool refreshing drink. As it is hot summer still, guests in the home are also given PANA drink. 4 glasses water 1 glass curd 1/2 glass sugar, Bananas and raisins can be added for other festival days. Broken rice, salt, turmeric, dried mango powder boil in water, add sour orange juice, roasted fenugreek, cumin and coriander seed powder, seasoned with spices. Cut eggplant diagonally in big pieces, seasoned with salt, fennel seed, mustered paste, scrapped coconut and cook in coconut milk. Add ghee tempering. 10 portion rice and 6 portion whole moong dal boil with ginger, asafetida and salt and should not be overcooked, seasoned with ghee and serve. Melt jaggery until completely it becomes thick brown syrup like gum on low fire, add raw rice flour in a small quantities and keep mixing. 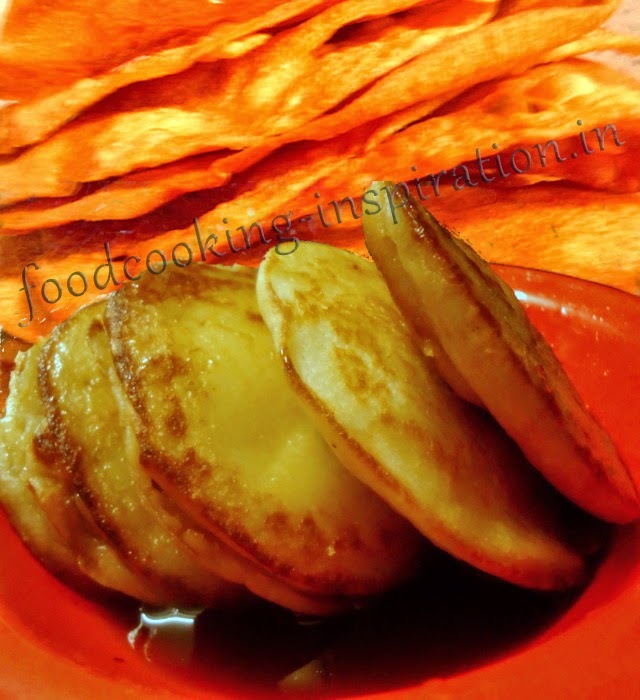 Remove and make flat breads from it on banana leaf, now fry in ghee. Boil ripe tamarind pulp, jaggery, rice flour, scrapped coconut, sweet pumpkin and salt, add tempering of white cumin and pepper corn. Fry popped rice [khoi] in hot ghee now toss with thick gum like jaggery brownish syrup [taste the syrup by putting in cold water if it is making candy ball or not], put off the flame, mix pepper corn, clove, black cardamom powder and camphor. Mix kalai dal paste, ginger, salt, asafetida, raw cumin powder make galls and fry in ghee. Make jelebis with Hansakeli mix dip in hot one-thread sugar syrup. Mix curd, soaked black chana or Bengal gram, turmeric, gram flour and salt, add tempering. Cook Mawa or khoya and misri [bengal sugar candy] or sugar to be condensed by heat, add raisin, pistachio, black cardamom seeds and dash of camphor until it can be removed on laddle. Make sweet balls or nadu. Boil two little milk on wider and heavy bottomed pan on low fire for hours, do not disturb condensing. After reduced the volume sufficiently turn off the fire. After cooling the milk completely slowly roll the film of milk carefully from the top of the reduced milk like a cream roll and offer. Lord Jagannath is said to be Daru Brahma and Anna Brahma, life force Itself in wood. ANNA or rice has become life force itself, and so all must be fed. Jagannath Puri is, therefore, known as ANNA KSHETRA, because so many rice offerings are made daily, and in no other temple of India is rice offered as the main prasad to deities, and then distributed to all. 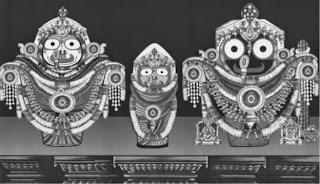 Lord Jagannath, Jagat Nath is a simple illustration of human nature and traits of God which makes it unique and distinctive from other worldly religions. The natural history of the cult also reflect the synthesis of human values and character. Different facets of human life have emerged within the cult to give it a unique place and stature. The devotee never think himself separate from his lord. The two are inseparable and are tightly hold with each other in the sacred bond of love, devotion and loyalty like daily happenings and day-to-day activities of a common man, everyday rituals of the God includes bathing, brushing of teeth, dressing with a variety of colourful dresses and adornments in definite time intervals. The Vedic hymns contain in them the subject matter of various disciplines of human knowledge; namely religion, art, music, culture, geology, physics, chemistry, botany, zoology, sociology, poetics, agriculture, astronomy, astrology, cosmology, mathematics, literature, language, environment and others; all blended in one in Lord Jagannath puja riti and nitis. Out of the four Vedas, Rig, Yaju, Sama and Atharva most of the Suktas of the Rigveda are connected with religious discourses for nature embellishment, the geological aspects of the Rgveda since we are to identify here the stones and metals mentioned in the Vedas. Moreover, there was spectacular advancement in the study of metallurgy during the Vedic period. The essential feature of the Yajurveda is relevant to the performance of sacrifices. The Yajurveda refers to some inorganic materials like rocks, soil, mountains, hills, sands etc The Samaveda is the foundation for Indian music. The Atharvaveda is noted to be the foundation of the science of Indian medicine. It is also observed that this Veda is the source of the Science of Indian Archery [Dhanurveda]. Different types of stones have been used in the construction of various temples of our country. The famous Jagannatha temple at Puri is made out of a type of rock called khondolites. The Yajurveda mentions the metals like gold, silver, iron, lead, tin, copper and steel for the performance of sacrifices. Out of these metals, gold and silver are chosen for making ornaments; and the utensils of the deities are specially made of brass, silver, copper and gold. The use of earthen pots were there in the ancient times. White, red and black soils have been mentioned in the Grihyasutras. To sum up, it can be said that Jagannathism totally rests on Vedism in respect of geological components and so many other attributions. Vedic thoughts and pantheons have been reflected here in the Jagannath Cult. The elements of Daruworship, Ratha Yatra, mode of worship employing Gayatri-mantra for meditation, surya pranam for morning sun bath, temple architecture with Vedic stones, use of utensils made of metals mentioned in the Vedas and cooking of food for the deities of Srimandira in the specially designed pots made out of red soil referred in the Vedic hymns, etc. Some scholars regard Jagannath as Daru Brahma, godhead manifested in a wooden image. Pandit Nilakantha Das is of the opinion that in the Vedic literature of Rigveda the word 'wood' [Daru] is used to indicate the material of which the universe [Jagat] is made of. The images of the Triad evidently are tribal in character But the highly ornate abode of the Deities as Lord Jagannath of Puri in the eastern India that glorify the Gods are all classical tradition. An amazing array of rituals and rites are observed to worship the deity; rituals and fetes which require painting, craftsmanship, artistic use of clothes, floral ornamentation, dancing and singing and histrionics and even culinary skills! Among the manifold activities of cultural significance, the ritualistic adornments of the deity. The temple craftsmen and artists whose services are indispensable for the adornment include the sculptors [rupakara], the painters [chitrakara],the goldsmiths [bania], the tailors [daraji] the foil and solapith craftsmen [rangata silpi] etc, but they all work as per the direction of the Pushpalaka who are the most important persons in decorating the deities with flower. Art and architectures of the Natamandapa and Bhoga Mandap pour psychological and spiritual influence in the minds of the devotees which removes the mental tension and creates spiritual consciousness. Sri Jagannath's Ayudha is Shankha and Chakra. Shankha is the symbol of sound and Chakra is the symbol of wheel. Sound and wheel are industrial character. So Sri Jagannath can be called as the deity of Industry. 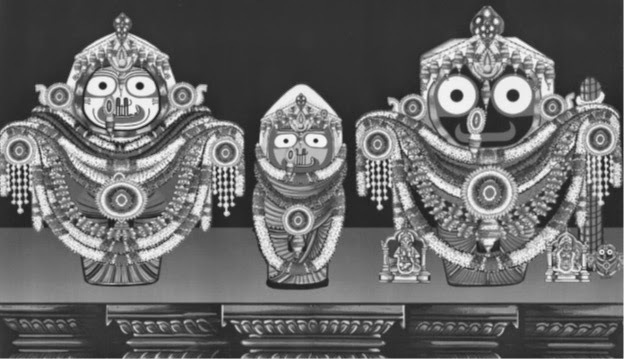 Sri Balabhadra holds Hala and Mushala, the symbol of Agriculture. So Balabhadra may called as the deity of Agro-Industries. Maa Subhadra has already been imagined as Brahma and She is the deity of knowledge. Sri Sudarshan, the point of rays as rays are reflected in the lens as a point, so Sri Sudarshan is the deity of real focus. Devotees get emancipation or salvation after art and architectures of the Natamandapa and Bhoga Mandap pour psychological and spiritual influence in the minds of the devotees which removes the mental tension and creates spiritual consciousness. Mahaprasad is distributed among the friends and relatives. It is said that by offering the same it perpetuates the ties of friendship and brotherhood. The cult is a simple illustration of human nature and traits of God which makes it unique and distinctive from other worldly religions. The natural history of the cult also reflect the synthesis of human values and character. The foods are cooked in usual Indian style through steaming, thereby preserving the nutrient values intact and it also makes the food tasty and flavor some. Cakes are prepared from grinding rice, Saga [green leaves] is given as religious offering to God everyday which is the daily food of a common man in the State. It has also been noticed that inside the temple of Lord Jagannath from Brahmin to untouchables all takes food from the same plate without any unfairness and discrimination among them. It shows that Jagannath is not the God of rich and affluent class of people but the God of the subjugated, needy and poor. Before him rich and poor, privileged and deprived, superior and inferior, Hindu, Muslim, Sikh, Jain and Buddhist all are similar. Therefore, he is called Jagat Natha i.e the God of entire universe and not confined to any religion, sect or creed. Sweeping of the cars by the king is another unique feature which indicates that nobody is greater than Him. The great Gajapati Maharaja playing the role of a sweeper, the lowliest in Hindu caste order exhibits the height of religious humility and conforms to the implication of Jagannath, the only Lord of the Universe. Of course, taking the deities in ceremonial cars, is observed in some major Hindu shrines in India but the manner of observance of nine days car festivals in Puri is definitely distinct and most uncommon. Lord Jagannath is more known to the outside world through His famous Car Festival. So Sri Sudarshan is the deity of Real focus. Devotees get emancipation or Salvation after Garuda Stambha is made with a root of a tree recognized by Ayurvedic Science. It is covered with a chemical solution. When a devotee touches his chest and hand, he feels well and his chest disease is cured. This also gives prevention of chest disease. The bathing water of the Garuda washes away different fevers of the devotees. This water also removes indigestion and dyspepsia. So the rituals, traditions, environment of Sri Jagannath Temple, and culture both are mostly based on Scientific background, there is no doubt. There are so many scientific traditions in the regular rituals of Lord, annual festivals and all the ethics of Sri Jagannath cult which influence the mind of human being of present society The evolution of man as manifested in Darwin's Theory is depicted as Dasabatara [Ten incarnations] which are mostly described in "Geeta Govinda" composed by Sri Jayadeva. Sri Jayadeva has written this poem by the blessings of Lord Jagannath. The nitis of Temple create cleanliness in the heart creating spiritual and sacred environment which develops the physique, mind and spiritual tendency of the human being. There is our old tradition that when we go to the temple of Lord Vishnu, Shiva or Shakti, we must go with sacred mind in empty stomach, otherwise we earn sins. Fearing the sins, we maintain our regularity in Darshan. If regularly we go to the Shiva Temple in empty stomach for His Darshan, we can get his Prasad: Belapatra, which prevent the chest disease and cure constipation. If we go to the temple of Vishnu or Sri Jagannath in empty stomach, we can get His Prasad: Tulsi, which cure issonofil tendency, cure thyroid defects and cold tendency and wash away abdominal defects. If we go to the Goddess temple, we can get both Prasads of Vishnu and Shiva. Lord Jagannath, Sri Balabhadra and Maa Subhadra have been mostly imagined as Vishnu, Shiva and Brahma or Shakti respectively. The communal mode of worship, from time immemorial, has taken the form of festivals. All communal worships have tended to assume the form of festivals. Festivals always involves the community, a gathering, a mela or a fair. It is the expression of a community on a festive and relaxed mood. Festivals are an inextricable part of Indian society. This is celebrated on the new moon day of the lunar month of Shravana. A special type of rice cake called 'chitau' is offered to Lord Jagannath at the temple. This cake is prepared and eaten with relish in almost every household. Gendeisuni, the goddess of snails and oysters is duly worshipped. These creatures are offered cakes and requested not to bruise the feet of farmers when they go to remove weeds from the fields. The festival is celebrated on the tenth day in the bright fortnight in pousha lunar month. The myth has it that Lord Krishna's son, Shamba, was cursed by a sage and he could get rid of his leprosy. The dreaded disease only by worshipping the Sun God at Arka tirtha, which is located on the Konark beach in Orissa. Women fast and worship Sun at dawn, midday and dusk and offer a variety of rice cakes and other delicacies. A mixed vegetable soup, known as 'Ghadghada' with leaves, tubers, local beans and pulse is a typical delicacy. This is held on the ninth day of the dark fortnight of the lunar month of Margashira at the onset of cold season in Orissa. The housewife worship goddess Shathi whose image is placed among seven dried fishes decorated with vermilon, collyrium and yellow rags. 'Kanji' [The peculiar soup made with rice water cooked with vegetables] , Amalaki or Amla [ a sour berry] and dried fish are invigorating in winter. In the month of January, Mahaprasad is sometimes referred to as Pahili Bhoga, the special morning bhoga offered to Lord Jagannath during this month. Traditionally, wives at this time visit their mother's house for a few days. So it is said that Lakshmi has gone to her mother's house also. Mother must feed Jagannath as Mother Yashoda fed baby Krishna. This special food is called Pahili Bhoga. It is the first food given to a baby and is of two types. One is very tiny little balls made of Bin Dal. The second is a very soft Khechedi rice. It cannot be eaten afterwards by devotees and it must be offered just at dawn. Then Lord Jagannath as baby Krishna "eats" this special Ballaba bhoga. Because the food in the temple kitchen must be prepared in such a pure way and with deep devotion, great spiritual impact is felt, both by those who cook and those who eat. In ancient days most of the celebrations were agricultural in their basic character having festivals mostly related to various agricultural operations. People thought certain divine powers were associated with various aspects of human life and festivals were scheduled in honor of Gods and Goddesses, who were supposed to control agricultural operations. The tradition of such festivals have also come down to the people of Orissa in the form of Raja-Sankranti [swing-festival], Akhayatrutiya, Gamha-purnima, Manabasa-gurubara, Nuakhai etc. Vedic architecture is an ancient system of design and construction based on natural law. The most peculiar uniqueness of Jagannath lies in his Mahaprasad or the cooked holy foods offered to him. In a caste-ridden Hindu society, the Brahmans and priests are not allowed to take cooked food from others, But paradoxically the Mahaprasad of the Lord is considered so sacred that even a staunch orthodox Brahman accepts it from the hands of a person belonging to the lowliest of the caste order. While the foods offered to all other Hindu deities are called Prasad, the same offered to the Lord Jagannath is known as Mahaprasad since it undergoes six type of purifications before it reaches the common devotee. The peculiar hearth [Chulla] in the kitchen of the Lord contains six openings symbolizing a Satkona Jantra. Nine earthen pots are placed at a time over such hearth representing a Navachakra Jantra, believed to have been prescribed according to the great Tantrik texts, Sarada Tilaka. This arrangement seems to be influenced by the tribal Sabari culture. Following the Odda Sabara Culture offerings consisting of rice boiled in bamboo poles [Menjan bhinne] or Mayens [some eatable roasted in fire] are placed before the God. This boiled or roasted cookeries were described as Sauribidhi cooking. Such elaborate procedure is nowhere followed for consecration of food offerings to the deities in Hindu temple. Even portions of the earthen containers of Mahaprasad are taken to remotest corners of India by Hindu pilgrims with the belief that very presence of the same in the house dispels all evil spirits. While partaking Mahaprasad from one another, the devotees do not scruple about caste, creed or religion nor do they mind about eating it from others mouths. The Mahaprasad [offering] of Lord Jagannath, the presiding deity is world famous. While the offerings for the deities in other temples in India are called prasad, those made for Jagannath are called Mahaprasad. Puri has the unique custom of discarding racism, casteism or the stigma of left over, when people share Mahaprasad together. The people in those days used to practice such knowledge for sustainable development. The knowledge is basically used to cure diseases of human as well as animal to develop nutrition, to bring out better agricultural systems in farming, to improve the arts and craft, and to maintain the religious practices and astrological beliefs. Indigenous knowledge is embedded in community practices, institutions, relationships and rituals. It provides the basis for problem solving strategies for the communities.